For businesses or organizations whose data is particularly sensitive or mission critical, disk fault tolerance and optimized performance aren’t luxury add-ons but absolute must haves. A Redundant Array of Independent Disks (RAID) provides the additional capacity, reliability and performance they need by combining an array of physical hard disks into a single logical disk. RAID is a common feature on servers and almost all storage platforms because no single disk could meet all the capacity and performance demands of a busy server. To make RAID an even more valuable feature for customers, Leaseweb has now automated its implementation – making it much quicker to deploy. Currently the feature is only available for CentOS, Debian and Ubuntu but we are working to bring the feature on board for more operating systems in the near future. 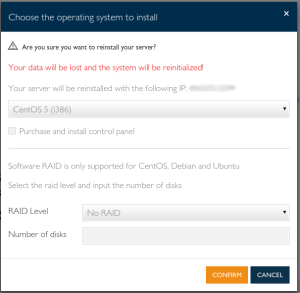 To deploy Software RAID for your server, simply log in to your Customer Portal account and click the ‘re-install’ button. You will then see the dialog box shown below which lets you choose the Software RAID level you want (0, 1, 5, 6, and 10). Enter the amount of HDD disks you want to apply the Software RAID on and you’re done. For additional flexibility we also offer Software RAID over LVM (Logical Volume Management). This is a particularly handy feature as it makes customers less dependent on our support department and allows re-partitioning of their servers in a very dynamic way. You can also deploy Software RAID using the Leaseweb API (refer to our Developer Portal for step-by-step instructions).